From coast to coast, Old Man Winter has been busy making his presence known, dumping snow and ice across much of the United States. As wintry weather takes hold, many homeowners are dealing with ice dams, a leading cause of damage to roofs and leaks inside homes. 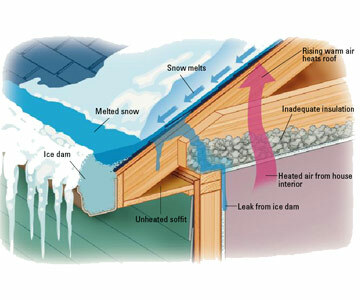 After a heavy snowfall, ice dams form when a ridge of ice forms at the edge of a roof and prevents melting snow from draining off the roof. 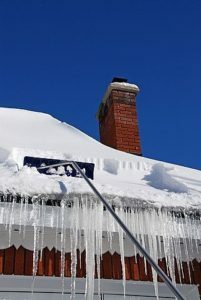 The ice traps meltwater, which can seep back up under shingles and drip through the roof into your house, causing damage to walls, ceilings, insulation, and other areas. 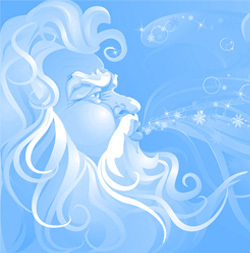 Here is how you can prevent these frosty formations from damaging your roof. The key to preventing ice dams from forming on your roof is to keep your roof cold. Even when the outdoor temperature is below freezing, if your roof reaches temperatures above 32 degrees F, snow begins to melt. To keep your roof cold, you need to keep the heat in the living space of your home. Adding insulation to your attic floor will help keep your roof cool and will also help lower your heating costs. Inspect and seal all point where warm air leaks from your living space into the attic. Use spray foam or caulk to seal areas such as vents, plumbing pipes, chimneys, and cracks around ceiling light fixtures. This job is best done in the winter as most attics are excruciatingly hot in the summer. After a heavy snowfall, rake the snow from your roof with a roof rake to prevent ice dams from forming. Roof rakes have an aluminum scraper mounted on a telescoping aluminum pole. Use one with small wheels near the rake scraper. The wheels will keep the blade from damaging roof shingles. Use extreme caution when removing snow from a roof. Never use a ladder when using a roof rake and don’t forget that snow is wet and heavy. Anyone with a heart condition, a bad back, or other health issues that could cause an injury should leave snow removal to a professional. They have the expertise and equipment and proper insurance to get the job done and protect you from liability. It’s a good idea to schedule a roof inspection with a roofing contractor. An experienced roofer can catch small problems from snow and ice before they turn into big ones. Not sure if you have roof damage? See How to Quickly Identify Common Roof Storm Damage. Innovative Construction & Roofing has years of experience with weather extremes in the Midwest and the damage it can cause to roofs. If you see a potential problem with your roof, contact us to schedule a free inspection. We are licensed, bonded and insured and specialize in both residential and commercial roofing. 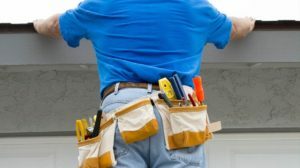 Our experienced and highly trained professionals can help you with everything from roof inspections and emergency roof repairs to complete roof replacements.